So you own your fair share of iDevices from Apple, and sometimes, keeping track of all the different accessories for them can be quite a headache. Perhaps there is a way to consolidate some of those accessories that have a common denominator, and the charger is one possibility. It is along this train of thought that the iCharge All Portable Charger was birthed from, where you will no longer need to worry about ending up with a drained iPhone, as all you need to do is plug your iPhone into the iCharge All Portable Charger, and you can start chatting away again. Of course, there is the caveat that the iCharge All Portable Charger itself should be charged to the maximum before you begin on your travels, but that is a different can of worms that we shall not venture to. The $39.99 iCharge All Portable Charger is capable of charging your iPhone more than once, and just in case you own an iPhone 5, there is always the Lighting to 30-pin adapter to help you out. The iCharge All Portable Charger will play nice with the iPhone 3G and above, and will also be compatible with a slew of iPods and iPads. No prizes for guessing just which iDevice would drain the iCharge All Portable Charger fastest. 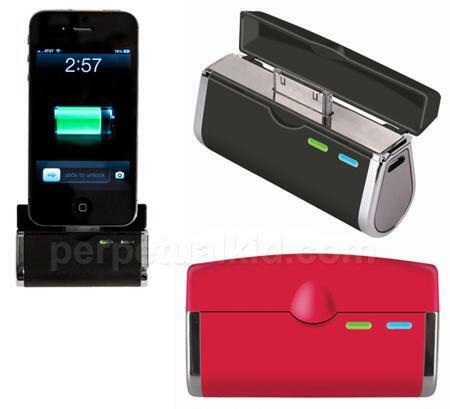 You can select between red or black colors for this 2.75” x 1.75” x 0.75” peripheral, where it will come with a USB cable, a handstrap and a built in lithium-ion battery which can be charged via USB to computer or a power adapter.